How does COPD affect breathing? When lungs are healthy, the airways and air sacs have an elastic, flexible quality. In people with COPD, the air sacs no longer bounce back to their original shape, and the airways can become swollen or thicker than normal. Joan Cousins was among a generation of young women who heard — and bought into the idea — that puffing on a cigarette was sophisticated, modern, even liberating. No one suspected it would make them more than equal to men in suffering a choking, life-shortening lung disease. “Everybody smoked. It was the cool thing to do,” said Cousins, who smoked her first cigarette 67 years ago at age 16. But one day, Cousins started coughing and could not stop — or take a deep breath. She drove to a hospital, where doctors told her she had a progressive lung disease called chronic obstructive pulmonary disease (COPD). “Not breathing was so scary … that I never had another cigarette,” Cousins said. COPD traditionally was considered a man’s disease, but it now kills more women in the United States than men. Women account for 58 percent of the 14.7 million people in the U.S. living with the disease and 53 percent of those who die from it, according to the American Lung Association. Nearly 8 percent of women in the U.S. have reported a COPD diagnosis, compared with just under 6 percent of men. Former first lady Barbara Bush, 92, suffers from the disease. An announcement Monday from a family spokesman that she is seeking “comfort care” is shining a light — and stirring debate — on what it means to stop trying to fight terminal illness. Because COPD is often associated with men, women are frequently diagnosed after the disease is already advanced. Symptoms of COPD include a chronic cough, wheezing, tightening of the chest and shortness of breath. There is no cure for COPD, but its progression can be slowed. The most important thing a patient can do after a COPD diagnosis is to stop smoking. Researchers largely blame women’s gradual adoption of smoking for the modern-day rise in COPD deaths among women. Men started smoking in large numbers in the late 1800s, coinciding with the mass production of cigarettes. In the 1920s and 1930s, tobacco companies began targeting women with ads that appealed to their sense of independence and yearning for social and sexual desirability. Gender differences also contribute to the increased danger of COPD for women. Research shows women may be more susceptible to the toxic effects of cigarette smoke than are men. The exact reason is not certain, but researchers believe one factor is that women’s lungs are generally smaller. Estrogen can also worsen the lung damage caused by smoking. 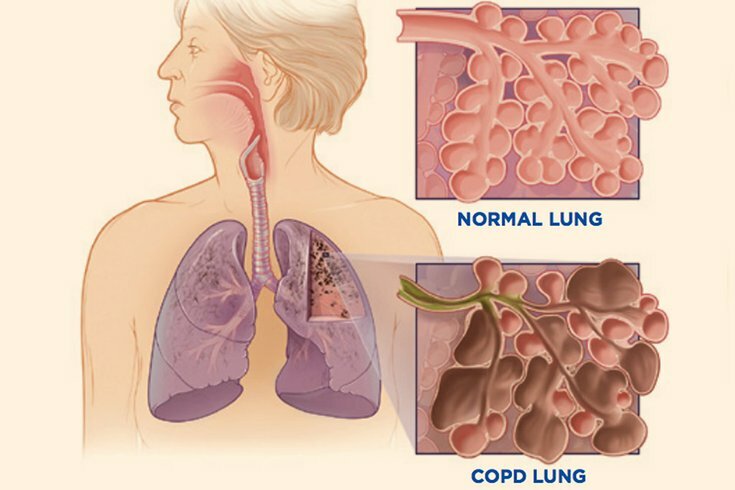 COPD is an umbrella term used to describe progressive lung diseases including chronic bronchitis, emphysema and other conditions that make it difficult for people to push air out of their lungs. Beyond smoking, factors such as pollution and genetics can contribute to developing the disease. Women are more likely than men to have flare-ups, or exacerbations, which can be caused by infections or exposure to pollutants. Frequent exacerbations are associated with a faster progression of the disease. Helena Bravi of Lawrence, Kan., said she has repeatedly gone to the ER since her COPD diagnosis four years ago, even though she is on medication and oxygen. When her COPD flares up, Bravi said, the pressure builds in her chest and she gets anxious. She tries to avoid triggers such as smoke and aerosols. COPD treatment, which can temporarily improve symptoms and lung function, may include bronchodilators to open the airways, inhalers and steroids, said Han, who is a volunteer spokeswoman for the American Lung Association. In the most severe cases, lung transplants might be needed. Doctors and advocates say many women are unknowingly living with the disease because they lack of awareness or are reluctant to seek help. Inez Shakman, 73, who lives in Ventura, Calif., and sees Dr. Wilgus, said she had problems exhaling for years, and common colds tended to settle in her chest and last longer than expected. She also found it physically straining sometimes to walk in the park. It was only about four months ago that she learned she had COPD. She’d never heard of the disease. Now, with medication, she can walk around the park without stopping or gasping for air, she said. Medical schools have long taught about COPD with a textbook that features images of two men, and researchers have detected gender bias in doctors’ diagnoses of the disease. In one well-known study, physicians who were presented with hypothetical patients made the correct diagnosis more often for men than for women.